Sarah is one of the first graduates of MOVE Wellness Studios’s Pilates Mat Training and will be completing the rest of her Pilates training at MOVE Wellness Studios this fall. 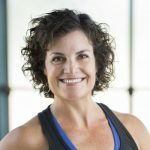 She is on track to become a Pilates Method Alliance certified trainer in early 2018. Sarah is excited to be a part of the wonderful team at MOVE Wellness Studios. Sarah took a break from the world of software development to stay home and raise her family. Physical activity has always been an important part of Sarah’s life – running, yoga, weightlifting, and many other forms of exercise. When she tried pilates, it was a lightbulb moment: “This feels amazing and I want to be able to share this with other people!” Sarah is looking forward to sharing the magic of Pilates with her clients.